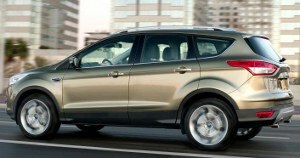 Difference between revisions of "Ford Escape (C520)"
'''Ford Escape/Ford Kuga (C520). 2012 to date (prod. n/a). 5-door SUV. F/F, F/A, 1498, 1596, 1999 cm³ petrol, 1997 cm³ diesel (I4 DOHC).''' Redesigned model, on platform related to [[Ford Focus Mk III]], but larger to keep up with competition. Sold globally this time—North America gets Kuga as the new Escape, and it was shown under this name first at the Los Angeles show in 2011. No V6 or hybrid, with Ford preferring to sell its Ecoboost models in the US. Excellent ride and handling, better quality, better fuel economy, though some noise from 2·0 petrol engine. Power tailgate. Chinese and US sales from second half of 2012. Mid-term facelift 2016. '''Ford Escape/Ford Kuga (C520). 2012 to date (prod. n/a). 5-door SUV. F/F, F/A, 1498, 1596, 1999, 2498 cm³ petrol, 1997 cm³ diesel (I4 DOHC).''' Redesigned model, on platform related to [[Ford Focus Mk III]], but larger to keep up with competition. Sold globally this time—North America gets Kuga as the new Escape, and it was shown under this name first at the Los Angeles show in 2011. No V6 or hybrid, with Ford preferring to sell its Ecoboost models in the US. Excellent ride and handling, better quality, better fuel economy, though some noise from 2·0 petrol engine. Power tailgate. Chinese and US sales from second half of 2012. Mid-term facelift 2016.